Background: Although sphingosine 1-phosphate (S1P) receptor activation by FTY720 (fingolimod) has been suggested to improve the prognosis of experimental stroke, the effect of the drug in early brain injury (EBI) after subarachnoid hemorrhage (SAH) and the precise mechanism of the effect are undetermined. In this study, we investigated the protective effect of systemic administration of FTY720 in EBI after SAH and assessed the mechanism using intracerebroventricular infusion of VPC23019 which is the S1P receptor antagonist. Method: SAH rats were produced by the endovascular perforation model and injected saline or 1mg/kg FTY720 intraperitoneally at 30 minutes after SAH induction. Neurological function, cerebral blood flow, amount of subarachnoid blood, and brain edema were evaluated to confirm the protective effect of systemic administration of FTY720. 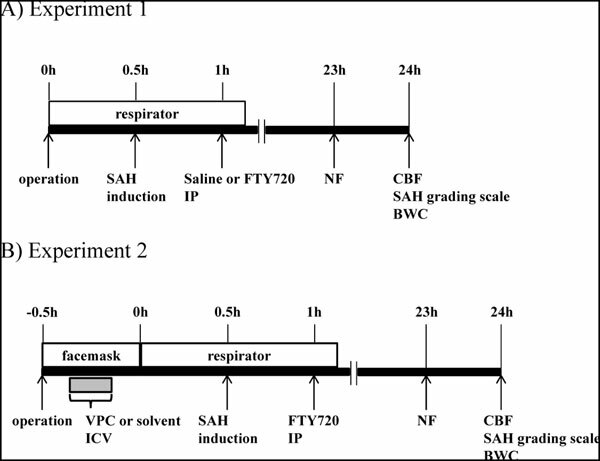 SAH rats also received VPC23019 intraventricularly before SAH induction to abolish the central S1P receptor activation. Results: Systemic administration of FTY720 significantly ameliorated SAH-induced neurological deficits and brain edema without modulation of CBF and the amount of subarachnoid blood. Blockage of central S1P receptor with VPC23019 did not abolish the protective effects of FTY720. Conclusion: The present study suggests that systemic administration of FTY720 reduces EBI after SAH and that the effect might not come from central S1P activation but be associated with pleiotropic actions of the drug. Brain edema, central sphingosine 1-phosphate receptor, early brain injury, FTY720, subarachnoid hemorrhage, VPC23019.